Today’s the day, I’m happy to announce the launch of EnemyOne on the web. EnemyOne is a small press publishing company that I’ve set up to publish other writers, comic creators and well, anyone who wants to join in on the effort. EnemyOne started as the brainchild of a bunch of young kids. I think we were all under the age of 25 at the time. With most of us hovering in our low 20s, if not younger. But it was in those early discussions that I truly discovered the internet and began to really learn what it took to make comics. Yes, comic books. You see we all had this grand idea to become the new Image Comics. A place where we could self-publish all of our work without rules, without someone telling us what we could or could not do. We would hold each other accountable but it ended there. We were such avid dreamers. It’s a ton of work trying to do everything on your own. It’s hard work finding artists to draw your scripts when you’re offering very little money or no money at all. And ultimately it didn’t really work out. After a few years we tried again but not much had changed. Some of us had moved on. Some kept at it in the trenches. Life threw many of us curveballs. But — some of us stood strong. And that’s what today is all about. 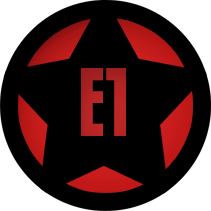 Today, we’re launching EnemyOne once and for all and we’ll have to see where we end up. It may have changed from what it once was but at the heart it’s still the same. Writers, artists and creators all joining together to create awesome things. The site, which you can find here, was designed by Adam Sypnier. That’s Adam Soandso to some, Rival to some more, Trevor Carrington to others (long story), or just a crazy guy who likes to move house all the time. 😉 He probably isn’t happy with the site. Designers rarely are. There’s always something that needs tinkering, some font that has to be changed last minute. I keep telling him that the site’s gotta go up at some point. He can play with it all he wants later. We’ve got no less than four books we’re launching with including a webcomic (on Monday) brought to us by the aforementioned Adam Sypnier and artist Karl Slominski called The Rivals. They’ll be updating Mondays and Thursdays on the site for the next little while. Please do check it out. It’s some crazy goodness. As for the books — we’ve joined forces with a father and son team. Well, not a team per se. But they ARE father and son. 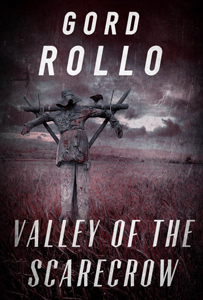 Gord Rollo is an author of horror, whereas Jam es Rollo (the father) writes westerns and poetry. I do hear he’s got a thriller up his sleeve though. Gord’s books have been out of print for the last year or two and what better time than now to get out there and strut his stuff again. I know he’s got fans waiting and he meets more and more every day at work when he handsells his novel that he’s had sitting in his garage. (That book is Strange Magic, btw.) I’m sure it must be extremely motivating to have his works available again. We were happy to be right there to lend a hand when he needed it most. I, personally, was extremely grateful when he finally agreed to let me run the gauntlet with his works. I can’t wait to see what kind of success his books will have now that they’re finally back out there again! We’ll be doing all new print editions as well for those that still love the feel of paper in their hands. I redesigned Gord’s brand from the ground up including all new covers and we’ll be re-releasing his entire back catalogue of works over these next few months. Come Christmas we should see no less than 9 or 10 solid books out there. Some will be old, some will be novellas, some will be completely new to his readers. A little birdie told me we might be publishing his brand new novel, The Translators too. We hope so. I’ll obviously be releasing some of my own work eventually through EnemyOne. This past year I took a hard look at where I wanted to go and drawing comics wasn’t something that interested me 100%. It’s a ton of work for very little pay off. Deep down I always had much bigger ideas. Different areas I wanted to explore. I’ve been learning at such a rapid pace lately now that I’ve started looking elsewhere, it’s shocking. I love designing, I love making books, I love helping people, I love writing, I love creating. If I were only drawing comic scripts, I’d have very little time to do what I really wanted to do. I learned that the hard way while doing Shuddertown. One issue of that series basically took me a month and a half to two months to do. It was an interesting experience sure, but there’s not a lot that I could accomplish at that rate. I was simply too slow. In the past month or so though I’ve created an entire company, released 3 books, created covers, designed the print editions, launched the website, set up the newsletter campaign and have focused more on my own writing. The key is to be happy. You’ll be much more productive when you find what pushes your buttons. Will I still draw? Of course. Just not right now. Right now I want to write. I may even approach other artists to do some comics with me. At this point I’m not sure. I just want to be busy and have it stay that way. EnemyOne Twitter – Follow Us!